Northeast Monsoon is set to become active once again this week for Tamil Nadu. The Depression / Deep Depression pretty much ate into almost 10 days of the Northeast Monsoon without much takeaways for both Andhra Pradesh and Tamil Nadu. The effect of this disturbance is finally on the wane and pretty much negligible on the environmental factors influencing the monsoon as things stand. The disturbance near Andaman Sea by the look of it appears to be struggling to build momentum to grow. The proverb முதல் கோணல் முற்றும் கோணல் holds very good for cyclonic disturbances where birth pangs more often than not has a severe impact on its development. This is a blessing in disguise for us so that we could enjoy the rains as it comes through regular Easterlies impact. 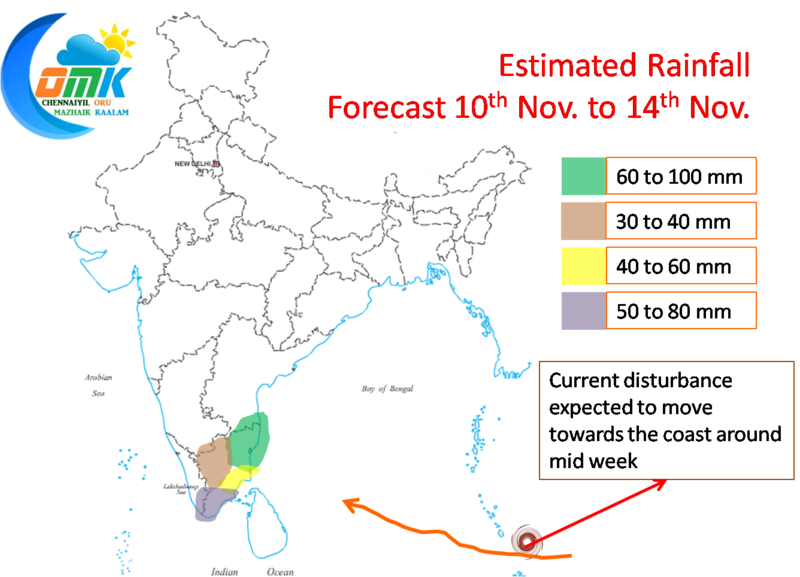 Hopefully starting from Tuesday night the rains would start again with the rains peaking around Wednesday afternoon to night as the disturbance near Andaman Islands winds its way towards the Peninsular coast as a Low Pressure Area. The rains are expected to continue until early Thursday.